The Best Hostels for Backpackers, Students, and Budget Travellers in Panama. Panama continues to grow in popularity with all types of travelers. It offers a very unique and diverse experience for visitors. There are impressive natural settings, nice beaches, and islands where you can party, snorkel, or scuba dive. Panama City offers glitz and glamour alongside history and culture. Panama is not a particularly expensive travel destination and affordable accommodation is relatively easy to find. There are hostels in most popular destinations and each hostel has its own style and characters. Whether you're traveling alone or as a group, a hostel can be a fun and affordable place to stay. 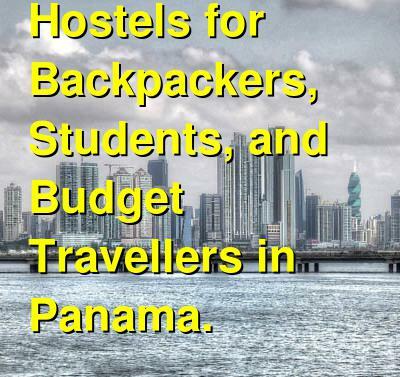 How much do hostels in Panama cost? An affordable and quiet hostel for backpackers and students in Panama City, Panama. Magnolia Inn is conveniently located in the middle of the old town, Casco Viejo. The neighborhood is charming and there is a lot of historic character in the area. The hostel is located in a restored French colonial house and it retains much of its character. There are also a variety of modern conveniences available including comfortable beds, wi-fi, and air conditioning. Although the hostel is relatively quiet, there are several common areas where guests can hang out and chat. There's also a full kitchen available and a dining room where you can enjoy your meals. If you want to stay somewhere comfortable and in the middle of everything, then Magnolia Inn is a good option for budget travelers. An affordable and fun hostel for backpackers, solo travellers, and groups of friends in Bocas del Toro, Panama. Bambuda Lodge is a fun and social place to stay. If you're looking for a cool setting and a fun environment then this is a great hostel. It is a bit secluded, so you'll end up eating a lot of meals at the hostel and this can get a bit expensive. Even so, it's reasonably priced and is a nice place to stay. The hostel also has a large pool, an on-site bar, and a restaurant. There are lots of places where you can hang out with other guests and the staff can help you organize all kinds of activities including snorkeling and hiking. The hostel has dorms that sleep up to ten people as well as double, twin, and three bed private rooms. A quiet and affordable hostel for backpackers, students, and budget travellers in Boquete, Panama. La Jungla Experience is a nice option for budget travelers who want a relaxing and comfortable place to stay. The hostel is located outside of Boquete's city center, but they do have free transportation into town once a day and cheap taxis anytime. There are also bicycles available that guests can use for free. This is a quiet place to stay with comfortable beds, friendly staff, and a welcoming setting. There's a library, hammocks, and a full shared kitchen. The staff can help you organize a tour to Los Cangilones de Gualaca, as well as other trips in the area. The hostel has dorms that sleep up to eight people and private twin rooms for visitors who want a little more personal space.